According to Wikipedia, Bibimbap literally translated means “mixed rice”. I had a lot of ingredients leftover from my Chirashi meal, so thought it would translate well into today’s recipe. I just want to note that this is nothing like the traditional Bibimbap dish, it’s my own personal twist on the classic dish. Just thought that it was really similar as I was putting it together! In a large skillet over medium to high heat, drizzle olive oil. Add onions and saute for 5 minutes, until the edges become golden brown. 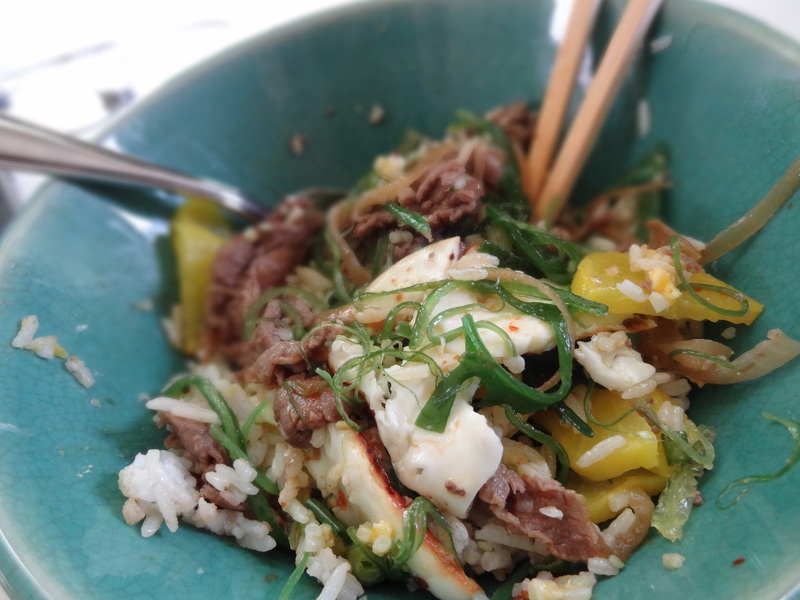 Add shaved steak, drizzle oyster sauce and Mama Sita’s BBQ Marinade atop. Cook for about 3 minutes on each side. Saute for an additional 2 minutes. Top with scallions. Remove from heat. 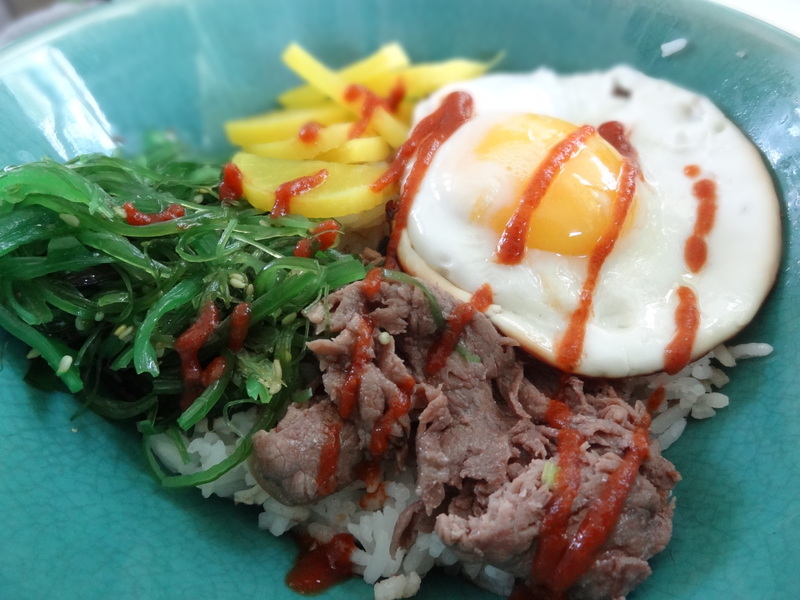 In a large bowl, add rice, top with seaweed salad, pickled daikon radish, fried egg, and sauteed onions and steak. Drizzle with Sriracha sauce. 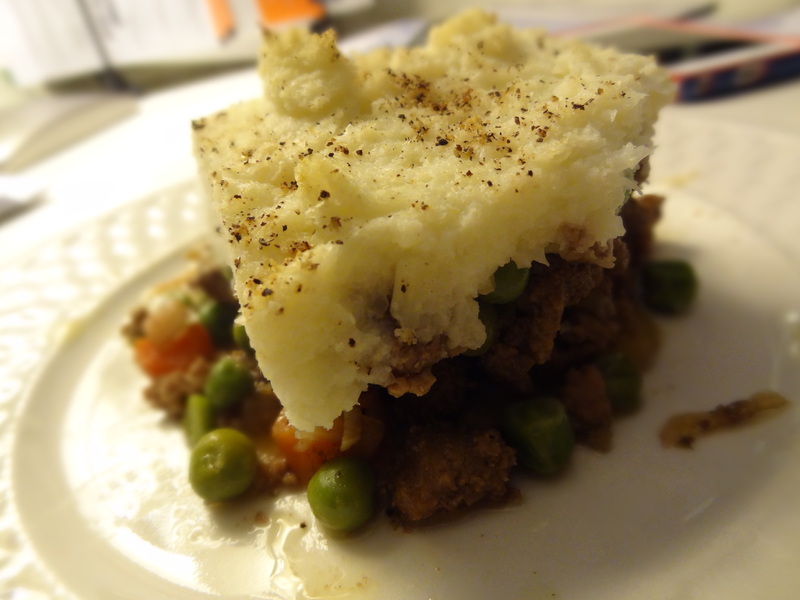 This Shepherd’s Pie recipe is semi-Paleo. 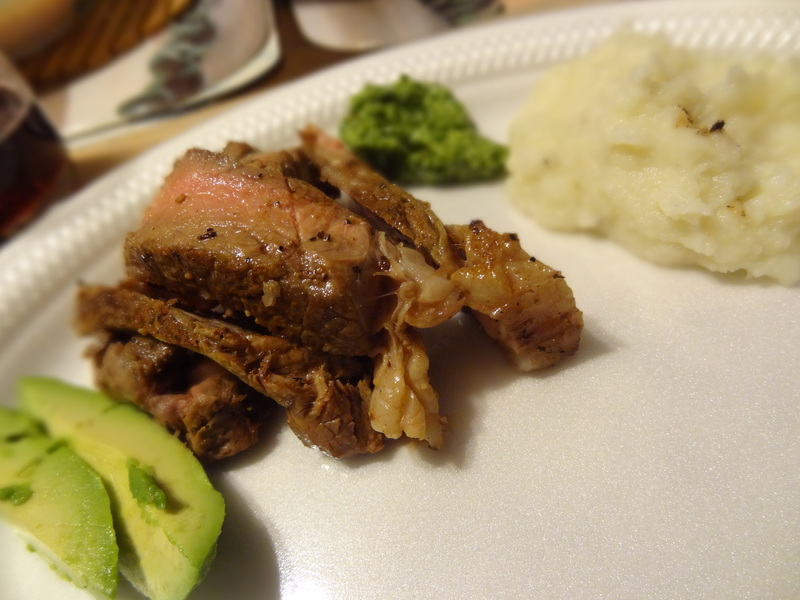 Everything is Paleo, with the exception of the peas. 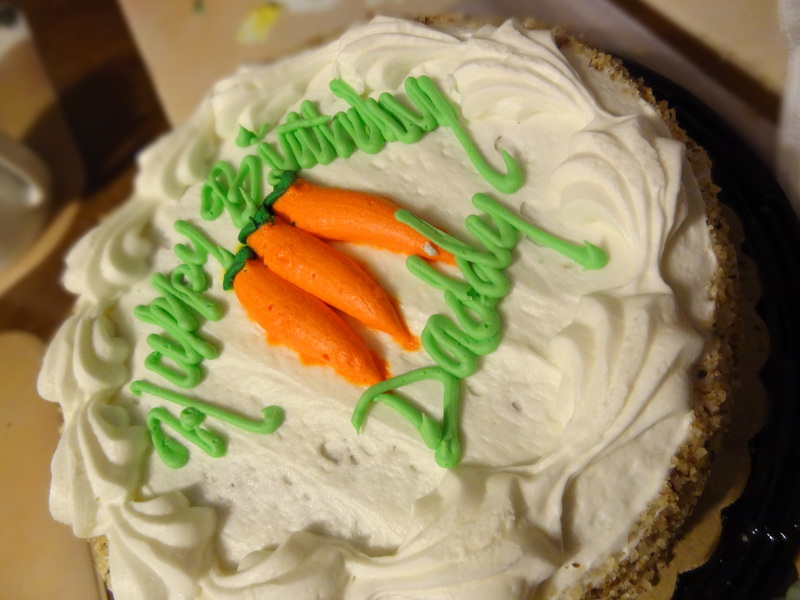 No legumes on the Paleo diet, but to me, it’s a veggie, and veggies are good for you! 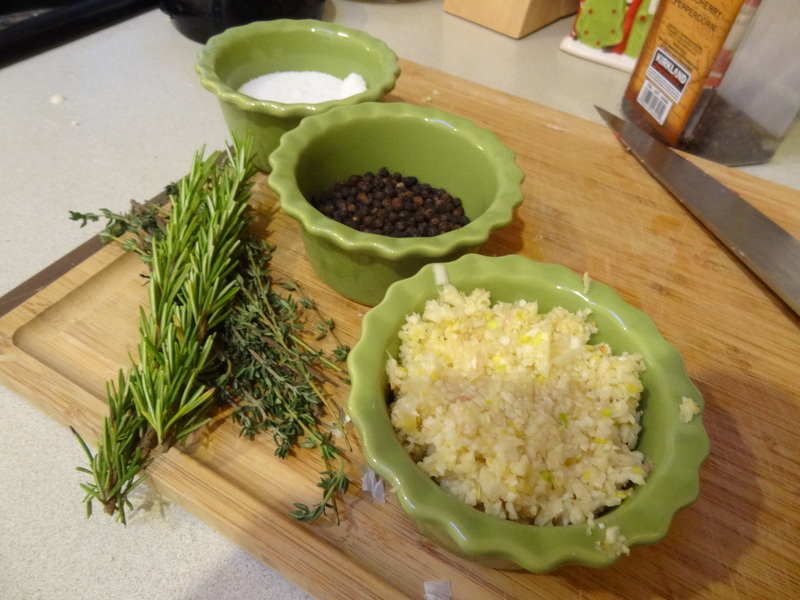 Follow this recipe for the mashed cauliflower topping. Note that the coconut milk is optional. I decided to add it this time because the cauliflower seemed drier than usual. Preheat ove to 400 degrees (F). In a large skillet, over medium to high heat, drizzle olive oil. Add onions and garlic, saute for a few minutes until translucent. Add ground beef, season with sea salt and black pepper, and cook for an additional 8-10 minutes, until beef is no longer pink. Add diced carrots, peas, and worcestershire sauce. Mix well. Saute until vegetables are nice and tender. Transfer beef and veggie mixture into a baking dish. Top with a layer of mashed cauliflower. Use a fork to form peaks in the mashed cauliflower so it browns nicely in the oven. Bake for 30 minutes. The 3 F’s of the Holiday Season – Family, Food, and Feasting!!! Ahhhhhhh, it’s been so long since I’ve posted! The whirlwind of holidays, visiting family, and numerous hours in the kitchen prepping, cooking, and feasting has finally come to an end. Back to work this week and getting re-adjusted to the normal life. As we grow older, we begin to realize the true importance of the holidays. It’s not about the gifts. It’s not about the amount of money that you spend on a gift. It’s interesting how we tend to believe that the more money you spend on someone, the more you love them? Anyway, not to sound cliché, but the best part about this past holiday season was the time that we were able to spend with family. Bjorn’s siblings visited from California and Texas, making an almost complete Bumactao household (missed dad!). We only see them once every 1-2 years, so their visit was extra special. And of course, we spent time with my family, who are all located in CT.
Me: So, have you spoken to your family? Bjorn: Yep, I made an executive decision. Bjorn: Dinner on Christmas eve. Me: Okay, super! At your mom’s, right? Bjorn: No, at our house!!! Me: **Silence** as I panic on the inside because this is merely days before Christmas and I haven’t planned ANYTHING! What to eat? What do I need to buy at the grocery store? What’s easy to make? How can I just use the oven to cook a majority of the items? Need to make a run to the liquor store. Need to clean the house. How will we divide and conquer? Needless to say, it all worked out in the end. 🙂 I spent most of my day/early evening in the kitchen, but it was well worth it. We had an amazing meal and enjoyed the rest of the night just hanging out, enjoying cocktails, playing board games (yes, no iPhone access for an hour! ), and opening our secret santa gifts. 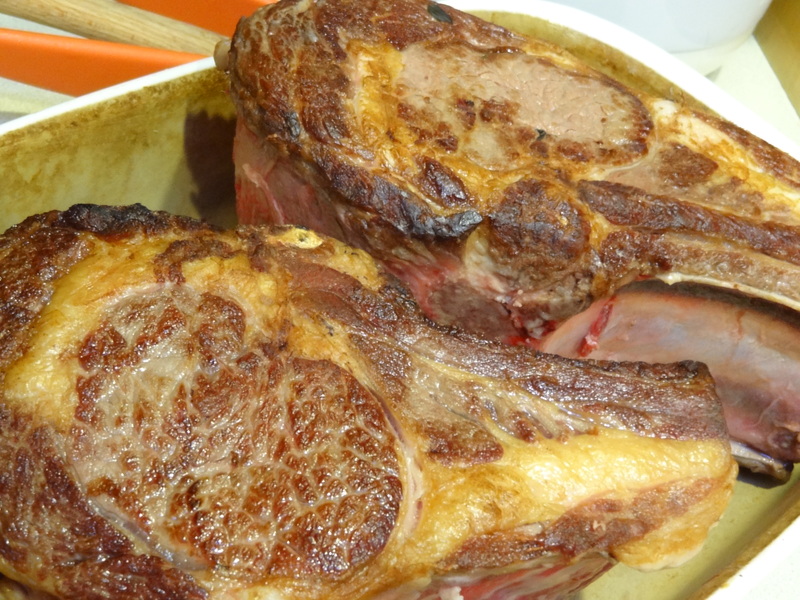 Cut rib eye roast in half (cooks more evenly in the oven). 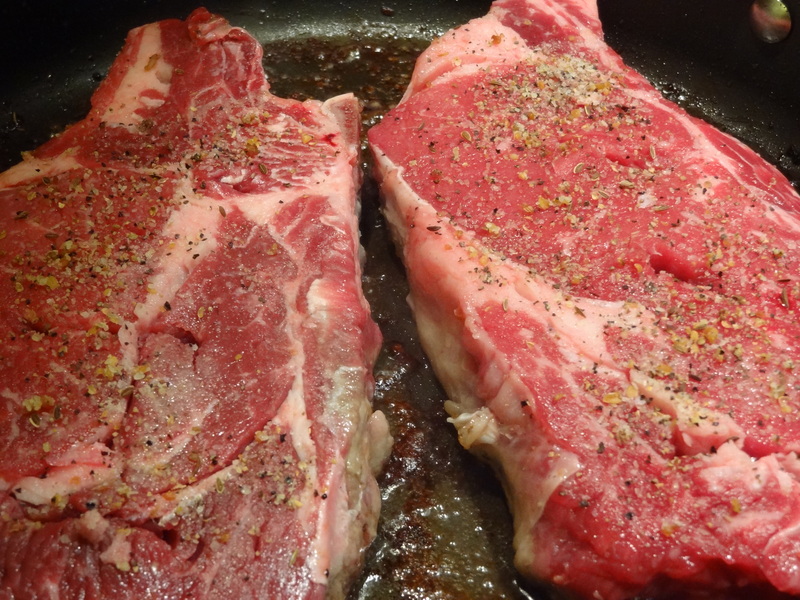 In a large skillet, over high heat, pan sear both halves in olive oil until nice and golden. Prepare the ingredients for the rub. 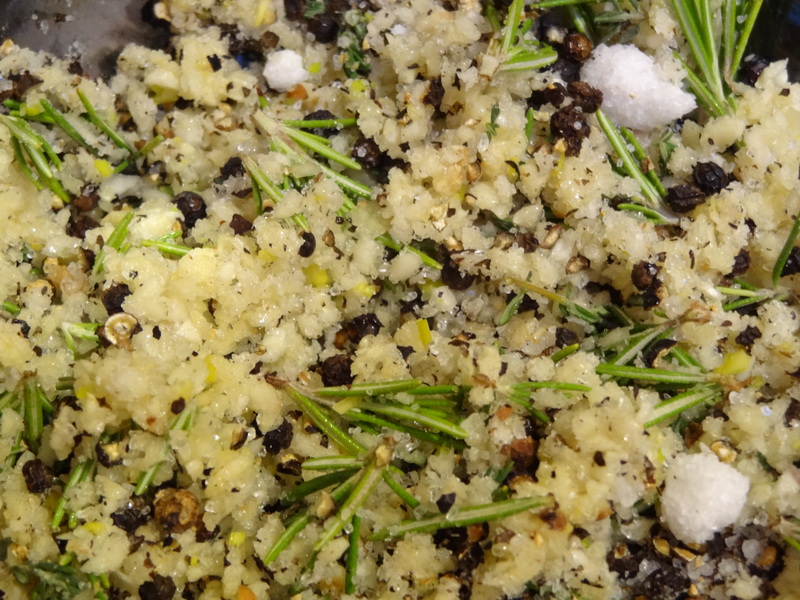 Place the peppercorns in a plastic bag and crush with a rolling pin (or any other tool that will do the job). Strip the leaves from the rosemary and thyme sprigs. Measure out the salt. Mince the garlic. Combine all ingredients into a bowl. 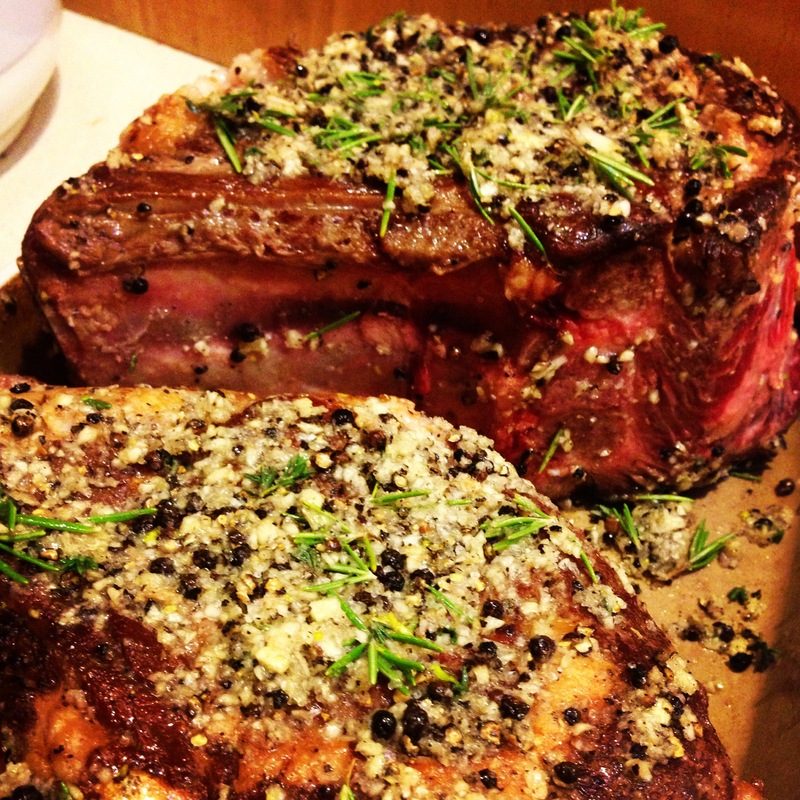 Drizzle olive oil on the rib roast and pat on the dry rub. Spread evenly and pat slightly to ensure that it sticks to the roast. Place in oven for 30 minutes at 500 degrees (F). 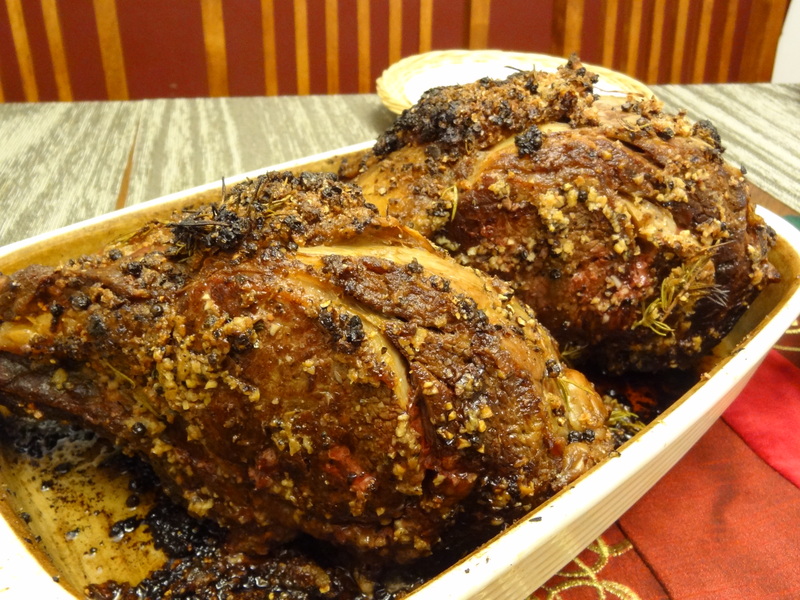 Then reduce the heat to 350 degrees (F) and roast for an additional 20-30 minutes. 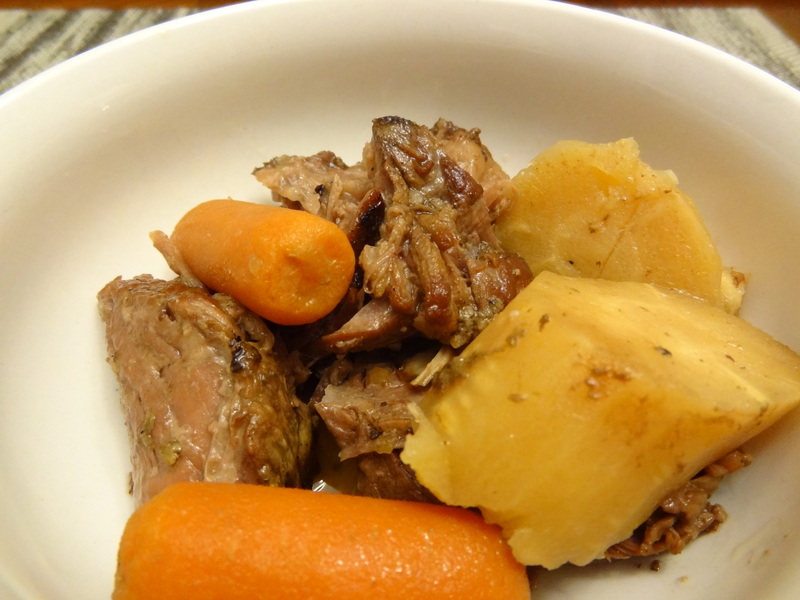 Use a meat thermometer to determine if the roast is cooked to your liking. 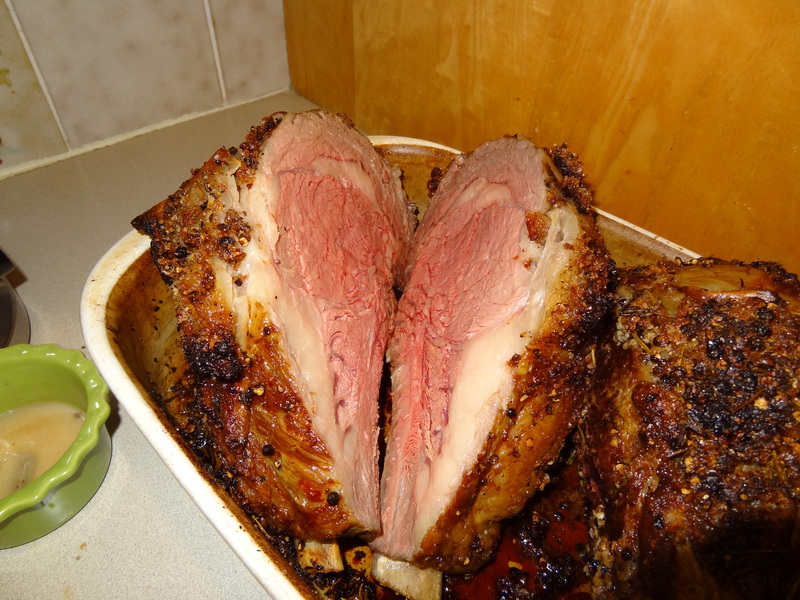 We love it medium rare, so I took this out of the oven when the internal temperature reached 145 degrees (F). Remember that the roast continues to cook a bit even after you remove from the oven. 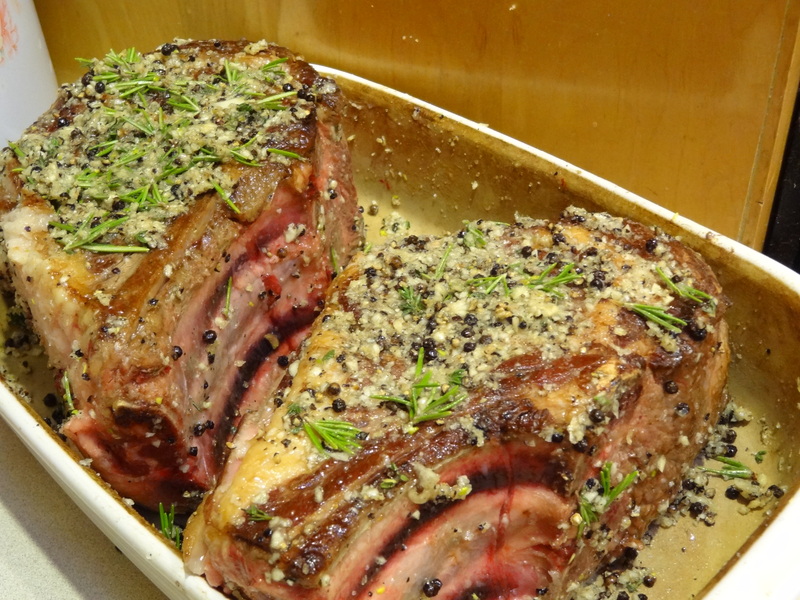 Remove from oven and let the beautiful roast rest for 20 minutes before slicing and serving. Yam Flour Pasta? Worth a try, I guess! No pasta on the Paleo diet so I’ve had to find substitutes. I’ve cooked with spaghetti squash which is pretty good. I want to make zucchini spaghetti next, but I have to purchase one of these first! A few months ago, I came across this deal on Groupon for a product called Nooodle. 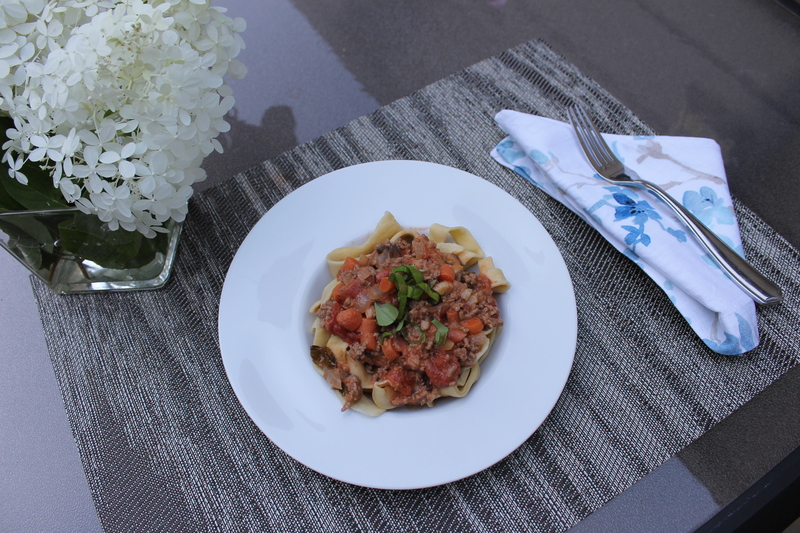 It’s a pasta made out of yam flour – gluten free, soy free, guilt free! Thought I’d give it a try. It’s an interesting consistency… Kind of chewy, kind of soft, kind of strange at first, but you get used to it. 🙂 For comparison purposes, I’d say it’s pretty close to a rice vermicelli (like the noodles they use in the Vietnamese dish, Pho). 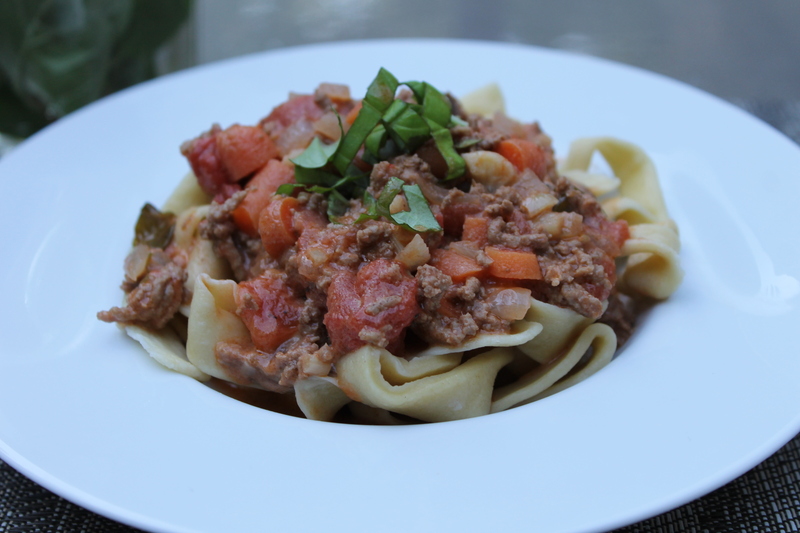 I’ve made this in a few different ways – chicken “nooodle” soup and in a meat sauce. I think I’m going to try some sort of stir fry next! Drizzle olive oil in a large skillet over medium to high heat. Add in onions and garlic and saute for 3-4 minutes. Add ground beef and brown for an additional 8-10 minutes, or until cooked through. Toss in the zucchini and mushrooms. Cook for an additional 5-6 minutes, until veggies are tender. Season with sea salt and black pepper. Add tomato sauce. Turn the heat to low and simmer for a few minutes. Prepare the Nooodle pasta separetely (follow directions on package). 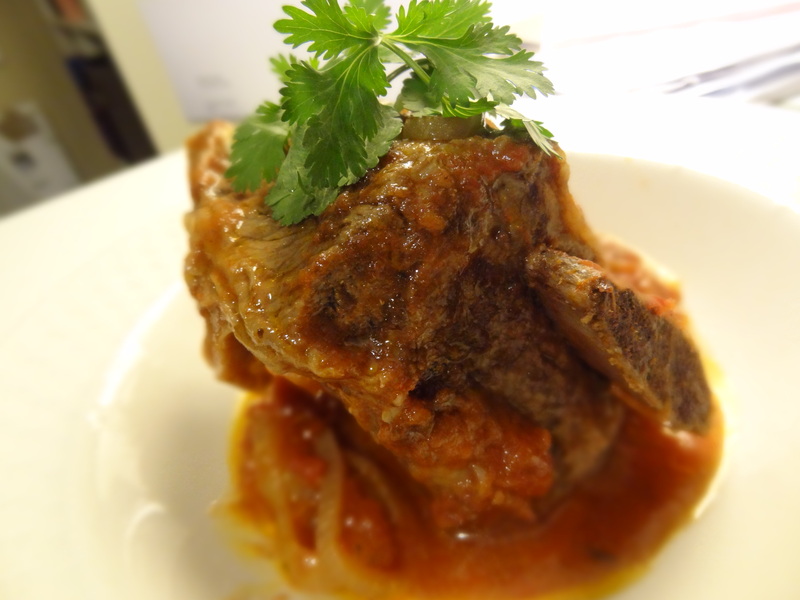 Once complete, mix in well with the meat sauce and enjoy! 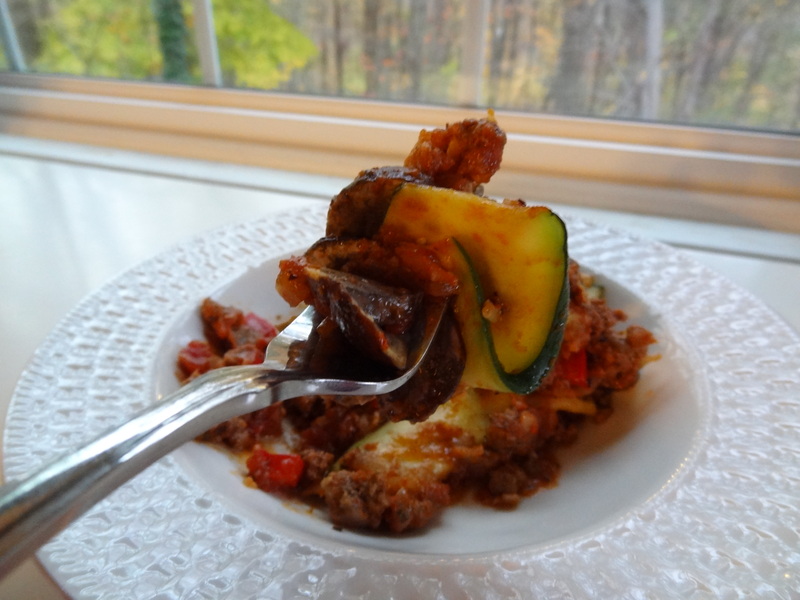 Zucchini Lasagna… Hold the pasta and hold the cheese! I bought a 16 oz pack of frozen grass fed 85/15 Angus ground beef from Trader Joe’s last week ($5.99/lb). I was kind of hesitant about getting frozen beef, but the price was great and it sounded good, so I thought I’d give it a try. Since I’m pretty sure we’re going to lose power tonight (and for the next few days, thanks to Hurricane Sandy), I decided to whip up dinner with ingredients that I already had in the fridge/freezer. I’ve never made a traditional lasagna before, but I love eating it. I’m a huge fan of any layering technique. It’s awesome because you get a taste of everything in one bite (see picture below!). Tonight’s dinner was a zucchini lasagna dish. 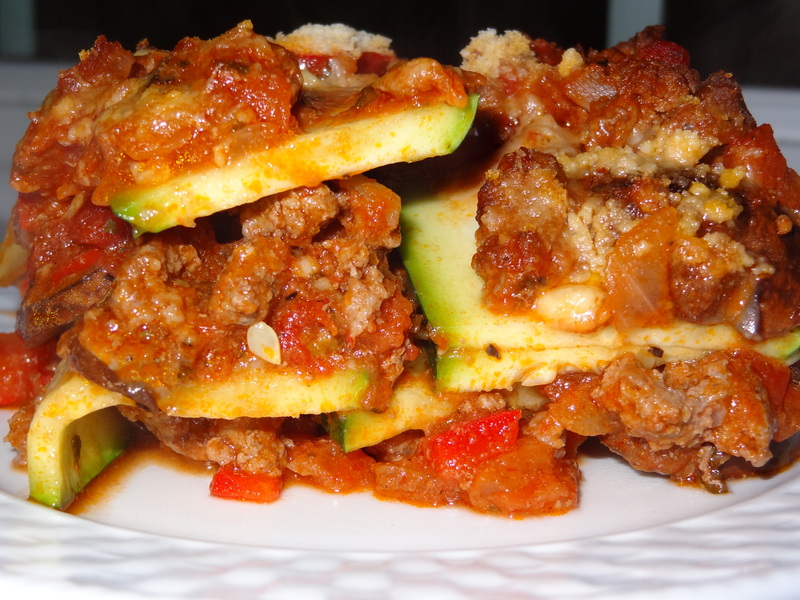 Lots of layering of the ground beef sauce, slices of zucchini, slices of baby bella mushrooms – and hold the cheese! In a skillet over medium to high heat, drizzle olive oil and saute onions and garlic for a few minutes, until onions become translucent. Add the ground beef to the skillet and cook for 5 minutes, or until cooked through. Add chopped red bell pepper and tomotoes. Mix well and cook for about 3 minutes. 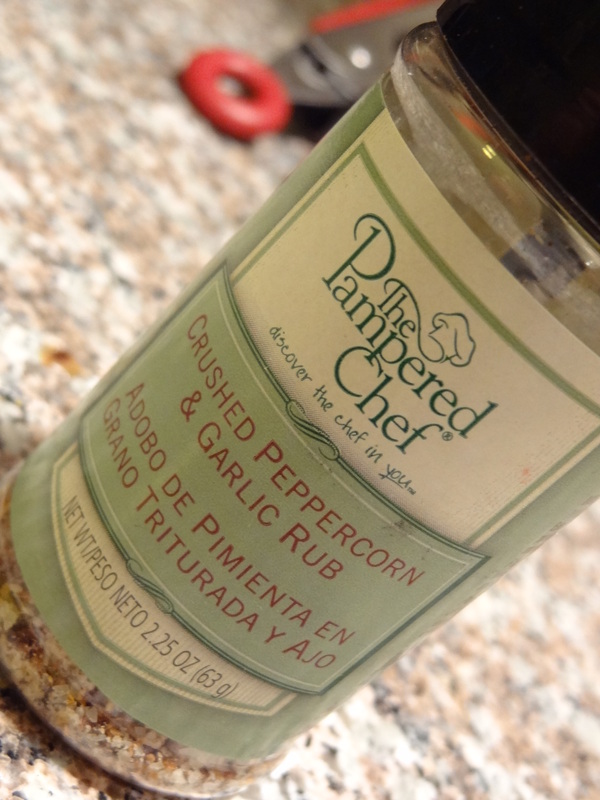 Pour tomato sauce into the skillet and add a pinch of sea salt, black pepper, and dried herbs. Stir for an additional 3 minutes. Set ground beef sauce aside. In a baking pan, coat the bottom with olive oil. Scoop the ground beef sauce into the pan and spread to create one layer. Layer with the sliced zucchini, then add another layer using the sliced mushrooms. Repeat steps 7 &8 until all ingredients are used up. Bake at 350 degrees (F) for 25 minutes. As you can see from the pics, it’s pretty messy when serving because it doesn’t have any cheese to hold it together. Doesn’t really matter; it’s all going to the same place anyway, right? Get in my belly! I don’t even know where to begin with this post. I just have too many yummy food thoughts running through my mind. 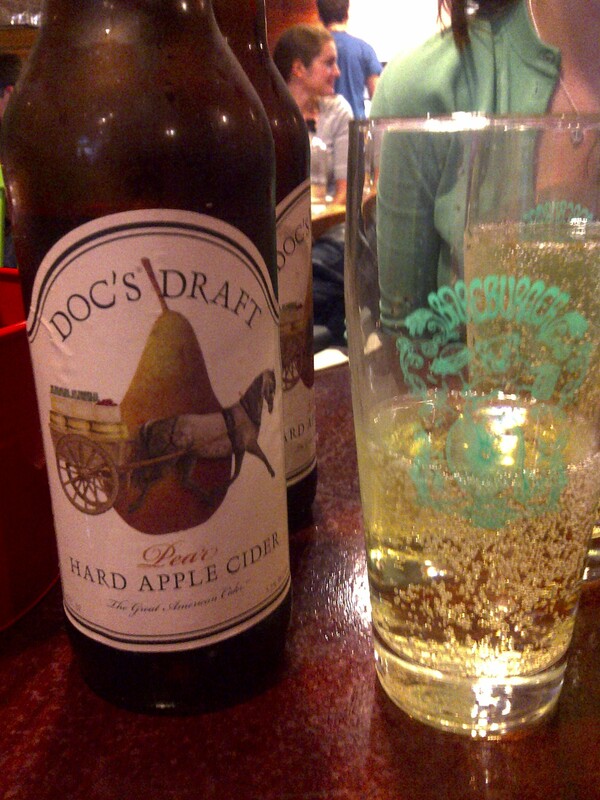 Okay, let’s backtrack to Sunday where I had a wonderful afternoon with one of my good buddies, Lindsey, out in the city! She moved there about a month ago and we finally found some time to get together – we had three goals in mind – EAT, SHOP, and GOSSIP. Perfect girl afternoon, right? I got into Grand Central and was starving, so my words basically were… “Lindsey, I don’t care what we do today, but we need to eat first.” Being the awesome foodie she is, she knew exactly where to go. 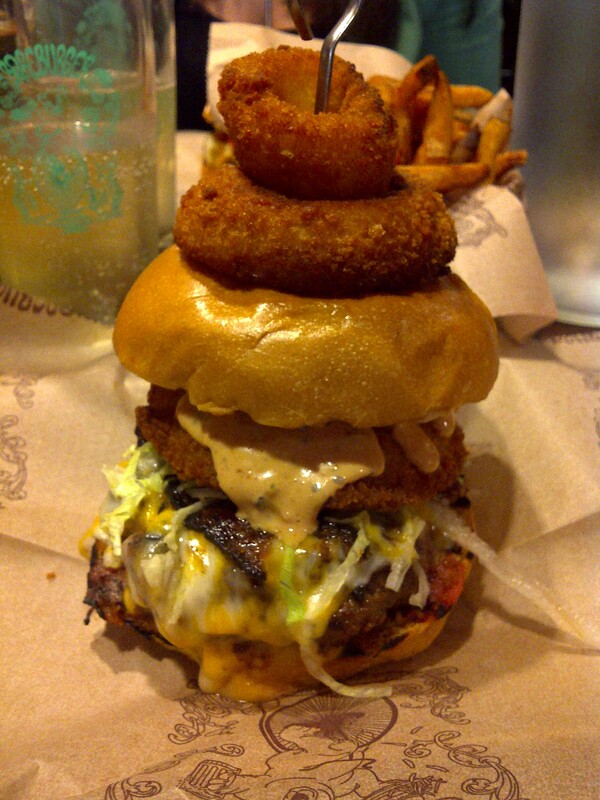 So, we walked a few blocks downtown to 33rd and cut across a couple of avenues to 3rd and met our destination: Bareburger. I loved that this place served grass-fed beef, free-range chicken, and organic and natural products. I had the Bareburger Supreme with beef and I ate it slowly so I could savor every single bite. Now, fast forward to tonight. After an awesome and sweaty Zumba class with my friend (and fab instructor), Pamela, I knew exactly what I wanted to make for dinner. 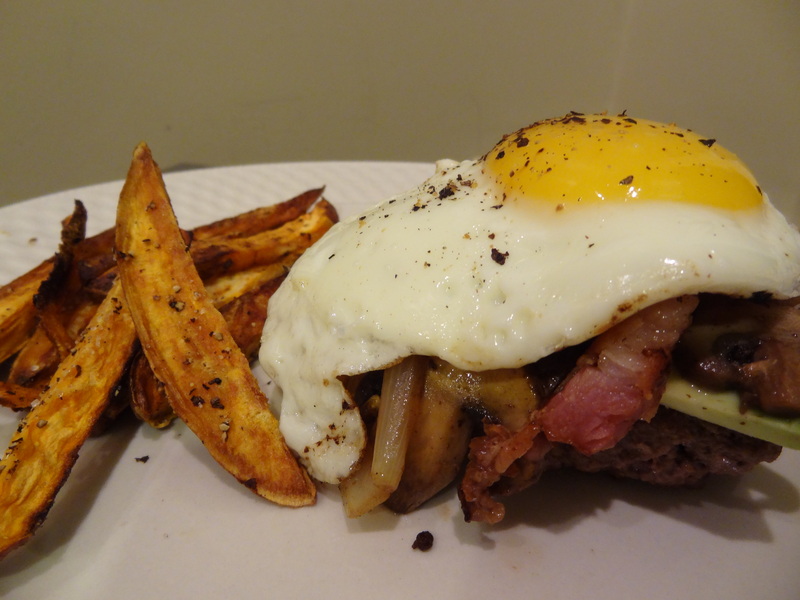 A scrumptious burger with savory toppings (hold the bun!) served with a side of baked sweet potato fries. Add all ingredients to a bowl, mix well. Add toppings of your choice; I added sauteed onions, sauteed mushrooms, sliced avocado, bits of uncured bacon, and a fried egg. Place sweet potato fries onto baking sheet. Drizzle with olive oil, sea salt, black pepper, and paprika. Bake for 20 minutes. It’s also helpful to check in after 10 minutes to give the sweet potatoes a good toss in the olive oil and other seasonings.